Easter is such a beautiful holiday, but here in the US, it does not even get close to the vast recognition that Christmas is showered with. I know that for many people the best thing about Easter is ham dinner, and Easter Egg Hunt games. These are wonderful and fun, but for me that is just not enough. Easter is not only a secular holiday but also a very spiritual one, at least for Christians. 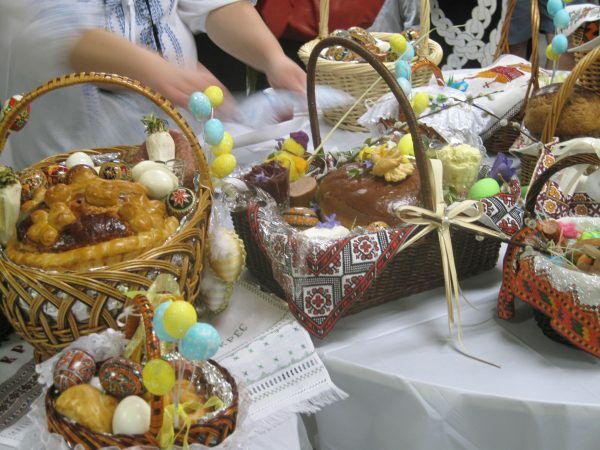 Actually, not only the Ukrainians bless their Easter Baskets, but also the Roman Catholics in Poland follow this tradition as well, which is almost identical to the Ukrainian one. Unfortunately, here in the US, I am not familiar with any of the Roman Catholic churches continuing this beautiful tradition, not even the Polish parishes. Please correct me if I’m wrong, but I am supporting my opinion by the conversations I had with my friends and acquaintances who are Roman Catholic, and of Polish descent. I am very curious to know if the Polish Catholics in other foreign countries continue with this tradition, because I know for a fact that this is a must for Ukrainians all around the world. By now you are probably getting very anxious to find out about this tradition, and of course I can’t wait to tell you. 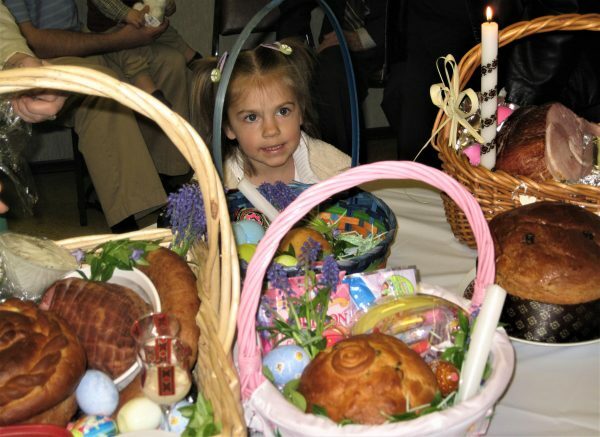 Since the Great Lent lasts for 40 days, culminating with the morning of Easter Sunday, everyone is anxiously awaiting to partake of the foods in the Easter Basket at Easter Sunday breakfast/brunch. There is a symbolic meaning associated with each of these foods, but that will have to be a future post. All of these foods are prepared the day before, and arranged in the basket the day of the blessing. 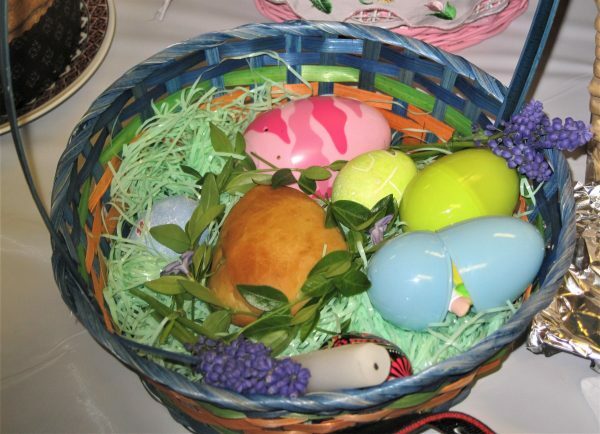 The completed basket is decorated with flowers and greens (optional, but almost everyone does it), covered with a foil or saran wrap, to protect the embroidered scarf from getting food stains. The beautifully arranged baskets are taken to the local Ukrainian church for a Blessing. The parish priest is all dressed in his special holiday robes, carries a cross, holy water and a prayer book, chants all the special prayers associated with all the foods to be blessed, and generously sprinkles the Holly Water all over the food filled baskets and his parishioners. It is a beautiful site, to see the numerous baskets sitting atop of rows of tables, with a burning candle in each, and beautiful embroidery adoring each basket, not mentioning the wonderful aroma of the food. Ahhh… if you could only imagine the aroma of fresh bread, smoked meats, horseradish…it is an amazing thing to experience. The though part is, that you are not all0wed to eat any of this food until after the Easter Sunday Liturgy, and in addition to that, you are fasting the whole day on Holy Saturday. Now you know why this food tastes so great on Easter Sunday. I live on the east side of Cleveland, and was surprised to read here that you don’t have Roman Catholic Churches that bless the food on Holy Saturday – as far as I know, all of the churches in our area follow this tradition! I didn’t even know that there were parishes that don’t participate, as ours have done it ever since I can remember. Hopefully, you can help spread this practice! Hopefully I was misinformed. Now I really need to contact Roman Catholic churches around my area and check it for myself. Diana, you sound like such a sweet and kind young lady. Wishing you, and your family, a wonderful Easter Holiday. Re: Blessing of Easter Baskets. There is a Roman Catholic Church in Key West, Fl ,where Easter Baskets are blessed. My daughter (Ukrainian) brings her basket there. It is also hard to buy a good ring of Kobasa there. Thank you very much for your comments. I love hearing that other churches still continue to practice this very special tradition. I have spoken to some people this weekend, who attend Roman Catholic churches, but they were not aware of this tradition. I wonder if many churches are doing it only for those who are still interested, and the others just don’t really care, or know about it. If you read my post about kobasa and contact some of these places I bet they would be able to ship it to you. Khrystos Voskres – Voistynu Voskres. I’m trying to find a recipe for the Ukrainian Easter cheese my grandmother used to make. It had dry cottage cheese, butter, salt, a tad of sugar, maybe an egg…then put into a cheesecloth with a weight on top to squeeze out the liquid. I’ve found some recipes that were baked, but this was just left at room temp for ~overnight. Any ideas? Also, love your halushky recipe…it brought back fond memories of Baba…she would make it for me when I came home from school (with the homemade pasta!). Hi Barbara. Thank you for stopping by and leaving beautiful comments. Actually, I am also looking for such a recipe, as my grandmother used to make it as well, but so far I have not come across it yet. I did find a recipe for similar sounding cheese, but not exactly the way I remember it, but have to try it first myself to check it out, before I post about it. Thanks SG…I’ll check back in with you. I’m Russian Orthodox and grew up in the Cleveland area, we decorate the Pysanky eggs the same way and the blessing of the Easter Baskets. Thanks for sharing the culture!! Isn’t that such a beautiful tradition? We are so blessed to still be able to continue it and pass it on to new generations. Thanks for bringing back some very pleasant memories. I grew up in the Pittsburgh area and this was a day that was so important to my family. The smells were almost overwhelming and knowing that we could not taste anything until the next day really tested our willpower. I know exactly what you mean, and you don’t have to be a kid to be tempted by these delicious food aromas. Everything tastes so much better at Easter, including the kobasa…. 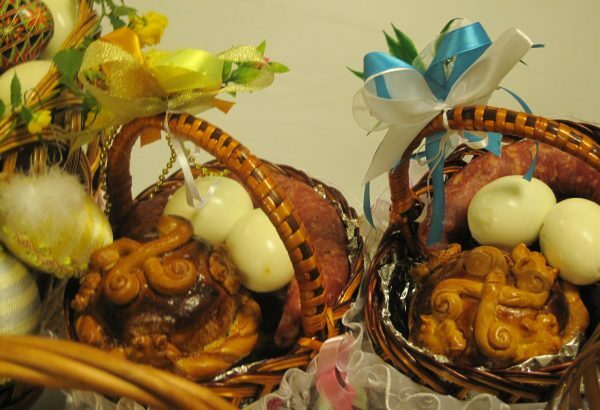 I was just googling Ukrainian Easter Basket Service to learn more about it when I came upon your site. My husband and I have just come from our first such service. We are not Ukrainian nor Catholic but were invited by friends of ours. We are in Winnipeg, Manitoba, Canada which has a large Ukrainian population. Unlike your service pictured, everyone places their baskets in the aisle beside the pews and at a certain point, everyone lights the candles so, the aisles are light on both sides by candles! The priest then walks once up the aisles and then on the return, blesses the baskets with a sprinkling of holy water. It was absolutely magical! And the variety of baskets was breathtaking – our host’s basket had a tiny lamb fashioned from butter! Thank you so much for finding my site, and leaving such a memorable comment. The Easter Basket Blessing style in you host’s church does sound very beautiful and breathtaking. I would have loved to have a picture of it, to use in a future post. 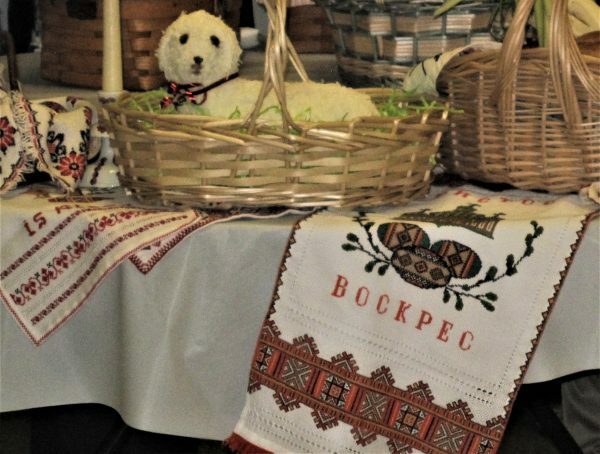 I have seen the “butter lambs” at a church bazaar in a Ukrainian church. They look so cute. I loved your picture of the basket and want to complement you on your Paska in the basket. Very pretty. 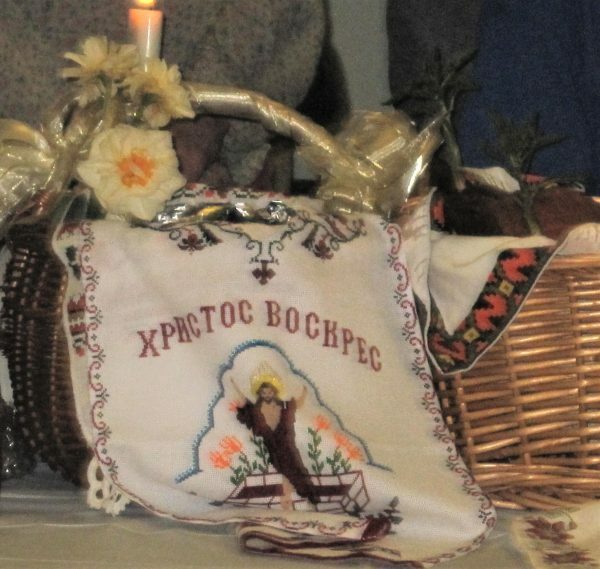 I am Ukrainian and take the basket to church to bless just like my Baba and my mom did. There is a Roman Catholic church in Longmeadow, MA – St Mary’s- and we blessed the basket there last Easter as I was visiting family. There is a decent number of Polish members who brought baskets. I always enjoy peeking at the baskets to see the different foods others bring to bless. You are so right – there is nothing like the smell of the ham, paska and kobassa. I have been making pysanka since I was about 10. Somehow it skipped a generation but my two granddaughters are becoming quite proficient. I explained that carrying on the tradition is their responsibility. I am marking your site – it’s very interesting. Thank you so much for such wonderful story. I am so glad you found my site, and like my posts. You are totally right….BABA it should have been….I am known as “BABA” to my grandchildren. I love the basket blessing tradition we have. It makes Easter time that much more special. I have been making pysanky with my children, youth groups, and can’t wait for my grandchildren to start learning this beautiful art and tradition. I am curious to know how did you decide to search for Eater Basket post at this time of the year?? I am thinking of changing rites, I am so glad that this is also a custom in your rite. 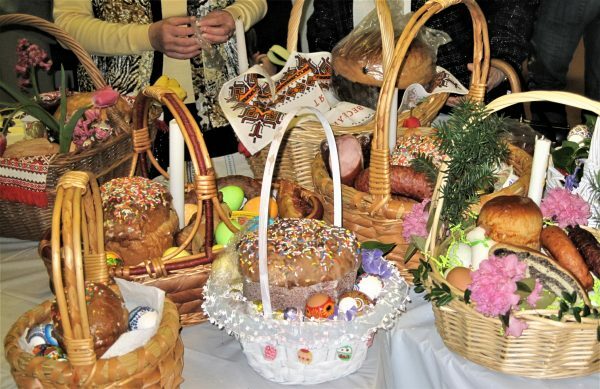 I live in Detroit, with such a huge exodus from the city in the 1970’s most non slavic parishes have blessing of baskets Holy Saturday. The only bad thing is the priest will use the standard blessing found in the Roman Ritual which lacks the traditional blessing for individual food Items. What day is this done in this rite? The church I used to belong to, Sacred Heart in Johnson City, NY, used to bless Easter Baskets on Saturday, early afternoon, and sometimes also on Easter Sunday right after the first Liturgy,so around 9 AM. The current church I belong to, St.Nicholas in Wilmington, DE does their Easter Basket blessing on Saturday afternoon only. I actually prefer to get it done on Saturday, since I can empty my basket at home and refrigerate the food until Sunday brunch, rather than keeping it out for 4 hours on Sunday while I am in church. This is a very beautiful tradition, which makes Easter that much more special. I love it! It is lovely to see that you keep our Ukrainian Traditions and I must say that all of our Holiday traditions are beautiful. 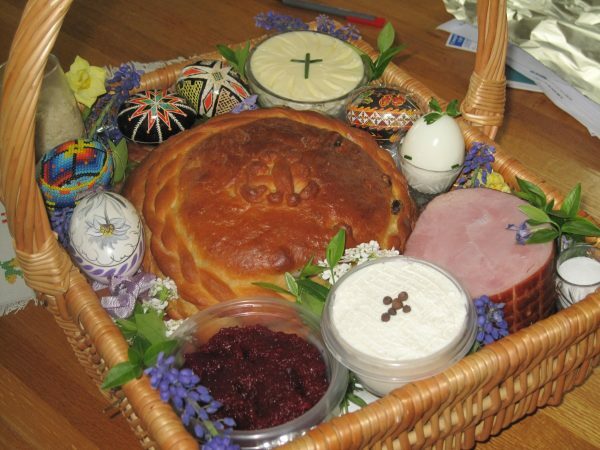 Just to enlighten you though: in fact many Eastern Europeans share our same Easter Basket Blessing Tradition. Catholics both Eastern Rite and Some Roman Rite, plus the Orthodox also practice this custom. 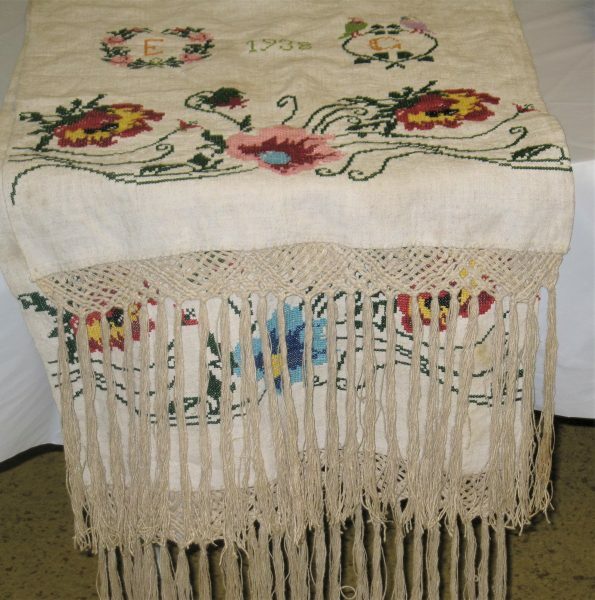 It is more a nationality thing and if you have grown up in a Slavic community you will see that many people have upheld the long and meaningful tradition. Christos Voskres and enjoy your Paska! Thank you for bringing back such GREAT memories for me of my childhood. My grandparents and dad were from the former Czechoslovakia. 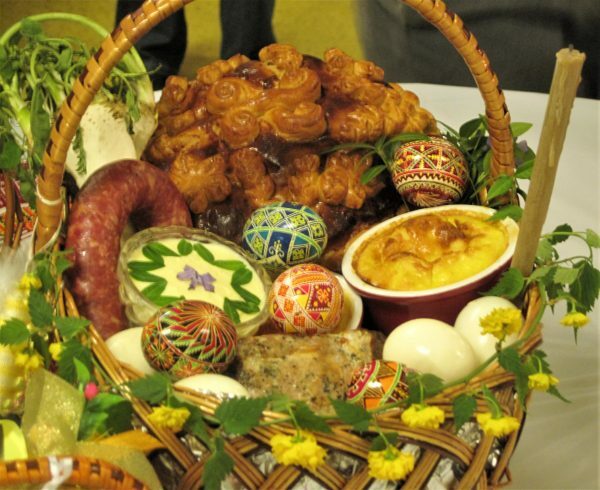 Every Easter babicka would prepare a BEAUTIFUL basket filled with all the symbolic foods. They were Byzantine Catholics and went to a Slovak church in Van Nuys, Ca. We had to wait also for the food to be blessed before we could eat it. 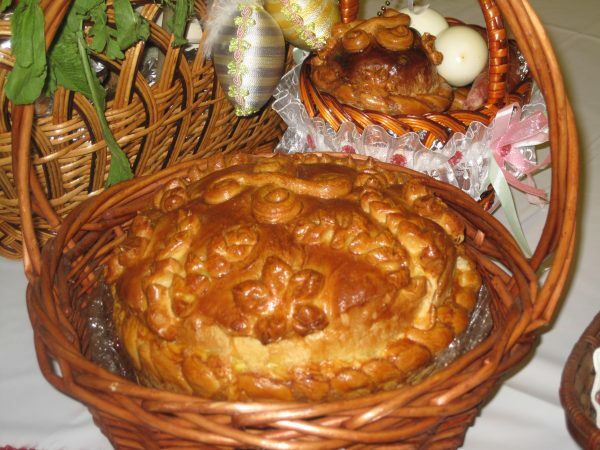 One of your readers requested a recipe for Hrudka (Easter cheese). I have a recipe that I think fits the bill. Can you give me your email? Beat eggs, add milk, sugar and vanilla and beat well. Cook in double boiler until mixture curdles. Pour into cheesecloth square, tie top and squeeze. Hang up to drain for several hours. Remove and refrigerate. Ohhhh…..you made me feel wonderful, knowing that your family also used to practice this beautiful Easter tradition of Food Blessing. Thank you so much for visiting my blog and leaving such memorable comment. Khyrstos Voskres!! Christ is Risen! Happy Easter! Thank you very much for sharing your recipe. I will try making it and once done, posting your recipe and my picture of the finished product. This recipe sounds different from what my mom was using, but maybe someone will find it interesting. My mom did not use egges…it was mainly farmers cheese, salt and caraway seeds…this is all I remember..and it was firm enough to be sliced. That is wonderful. I love this Easter tradition. It makes Easter so special.